My two Code Clubs have started up again. There are 20 students and 2 high school volunteers for each club. The first meeting has happened. Students learned about Scratch, had fun and I’m excited for both clubs. This is my 3rd year. It’s session #6 & #7 of Code Club for 4th graders in my city. I know all the students from my school but only 2 of the students from the other side of town. One thing I worry about, now that I have been coaching Code Club and teaching Scratch to elementary students for three years, is forgetting what it is like not to know how to program in Scratch, not to know what a Sprite is or know that the Stage has no movement blocks, etc. I don’t want to assume that they know what I know and I want to present concepts that will be relevant to what they do understand. (I realize this concern is not unique in the teaching profession). I have on the calendar for the first session of Code Club: “First meeting – Rules & Goals, Intro to Scratch”. So I decided to morph the Rules & Goals and include a bit of the first step in thinking like a programmer. Defining rules & goals is a big part of what a programmer really does. I tried framing the rules in pseudo-programming language with the students as well: If the day is Wednesday and the second bell rings, then it is time for Code Club. When you open up Scratch, forever have fun. I’m not sure I got my point across. 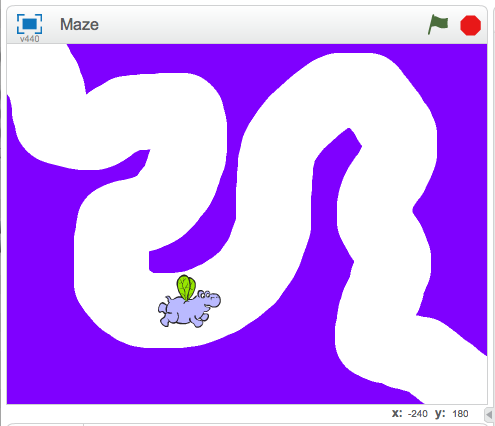 I presented the Maze game to Wednesday’s club because I knew they had used Scratch before as 3rd graders. They struggled a bit. Most of them were able to get their Sprites to move around using arrow keys and set up the maze background. Some were able to get the conditional sensing color code working. And this one below added a squirrel that spins around the screen changing colors of the hero. Cool. On Thursday I introduced Scratch concepts to 3rd & 4th grade programming newbies and blew their minds with the possibilities Scratch offers through simple blocks of code. The energy was thrilling and left me pumped. After introducing the same concepts of defining rules in code, (and Code Club) the first thing we tried was Motion blocks (ie moving a Sprite with the spacebar). And then we added Looks (ie change color). And finally, the awesome: Sounds forever! 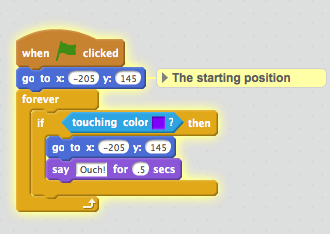 In reviewing all of Thursday’s projects, I found those kids had some serious fun with Scratch last week! I can tell I haven’t blogged in a while and I struggled to write this coherently and in a timely fashion.